On October 29th, 2018, Governor Roy Cooper signed Executive Order No. 80 committing North Carolina to an ambitious 40% statewide reduction of carbon emissions by 2025. To reach his goal, the governor is building on a history of progressive policymaking in North Carolina aimed at accelerating adoption of clean energy technology, including energy efficiency. As recently reported in SACE’s Energy Efficiency in the Southeast 2018 Annual Report, good legislative policy and a supportive regulatory environment at the North Carolina Utilities Commission have propelled the state far beyond its Southeastern peers in utility annual efficiency savings. 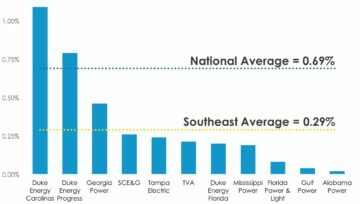 Incredibly, North Carolina was the only state in the Southeast to surpass the national average in 2017, while Duke Energy Carolinas became the first major Southeastern utility to finally reach 1% annual efficiency savings. 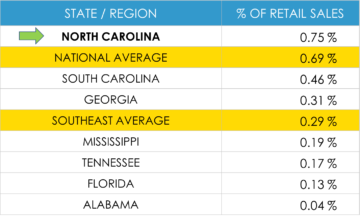 The unfortunate truth is that the Southeast as a whole consistently lags far behind the rest of the country on utility energy efficiency. Were it not for North Carolina and Duke Energy almost single handedly pulling the average up, the region would have scored much worse. So what legislative policies, regulations and agreements created the conditions for this success? In addition to these policies, there are two other important dynamics help explain the relative success Duke Energy has achieved in North Carolina, utility management leadership and robust stakeholder engagement. Duke’s leadership recognizes that North Carolina’s supportive policies create an opportunity to profit from successful energy efficiency investments, which has led management at the utility to go much farther than any of their peers in the Southeast. Furthermore, for nearly a decade, Duke Energy has actively engaged with efficiency advocates, stakeholders, and Public Staff in regularly convened Collaborative meetings, often with direction from the North Carolina Utilities Commission to address a wide range of energy efficiency related issues. These detailed, technical conversations increase energy efficiency success by helping Duke problem solve issues with existing programs, while developing new programs to drive future growth. Ultimately, efficiency is good for Duke’s bottom line, good for customer bills, and great for North Carolina. Nonetheless, Duke Energy is taking steps that may work against energy efficiency going forward. Rather than accelerate investments in efficiency programs, the company is planning to construct a whopping 9.5 GW of new gas plants in the Carolinas over the next 15 years. Low cost energy efficiency, while good for customers, could put at risk a potentially massive financial windfall for shareholders that comes with building new power plants. 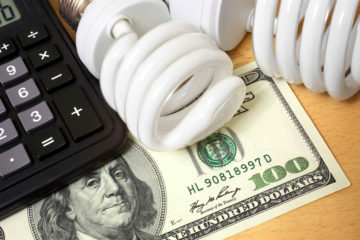 Furthermore, Duke Energy is currently pursuing a shift in rate design in South Carolina that would make it harder for customers to save money when saving energy. For more on that, see the recent post from my colleague Chris Carnevale on this important topic. North Carolina already has a solid clean energy policy foundation, the question now is will it be strong enough to build the ambitious energy future that Governor Cooper envisions? It is up to North Carolina’s political leadership, utility managers, and dedicated advocates like the Southern Alliance for Clean Energy and our allies to demonstrate that clean energy, including energy efficiency, can power the state’s energy needs better than a fleet of new fossil fuels plants. The Southern Alliance for Clean Energy is a leader in advancing Energy Efficiency throughout the Southeast. We promote cost-effective utility-funded energy efficiency programs to reduce customer utility bills, stimulate local job creation, and reduce the need for fossil fuel power plants. For more on SACE’s energy efficiency efforts, visit us at https://cleanenergy.org/energy-efficiency/.